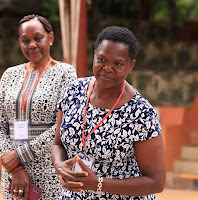 Home / Editor's Choice, Entertainment News, Featured Articles, Gossip and Drama, News, Politics / OYAMO demanded to talk to a LADY called LISA, who is close to OBADO’s wife, what info did he give her? OYAMO demanded to talk to a LADY called LISA, who is close to OBADO’s wife, what info did he give her? Friday, September 14, 2018 - Migori residents, who had gathered at Homa Bay Law Courts when Obado’s PA, Michael Oyamo, was presented before the Court on September 10th after his arrest over Sharon’s murder, were left in shock when he demanded to talk to a lady called Lisa Wema. Instead of talking to his family members or lawyers, Oyamo asked the court to allow him to talk to Lisa, who he described as a close confidant, before he went back behind bars. Lisa is a popular facebook blogger who has been blogging for Okoth Obado’s wife, Hellen. She is very abusive on social media and was once beaten by goons in a funeral for abusing a politician who has been opposing Obado. What shocked people is the nature of the information Oyamo gave Lisa, who is very close to Obado’s wife, Hellen. Some Kenyans have started linking Obado’s wife to Sharon’s death and calling detectives to investigate her. Before Sharon was kidnapped and killed, she had sent a SMS to Obado’s wife informing her that she was pregnant for the Governor. Sharon had informed a close family member that Obado’s wife was threatening her and at times trailing her movements.